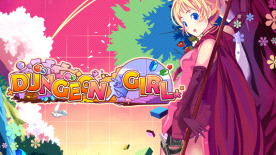 Dungeon Girl is a Puzzle RPG that's easy to pick up and play! Join Monica on her journey into the dungeon under the Tower of Light Blue, and conquer over 1000 floors! Match panels to explore the dungeon, and make them disappear to attack enemies. Explore, excavate, heal and attack. Start your adventure and see how deep you can go!